As some of you know, I have written a whole book on Mediterranean street food and while researching it, I tasted almost all there is to taste on the streets of Spain, Italy, Morocco, Turkey and Egypt to name a few of the countries I covered. Most of what I tasted was great. Sometimes delicious and fun and sometimes more fun than delicious. But there were a few specialities I did not take to. 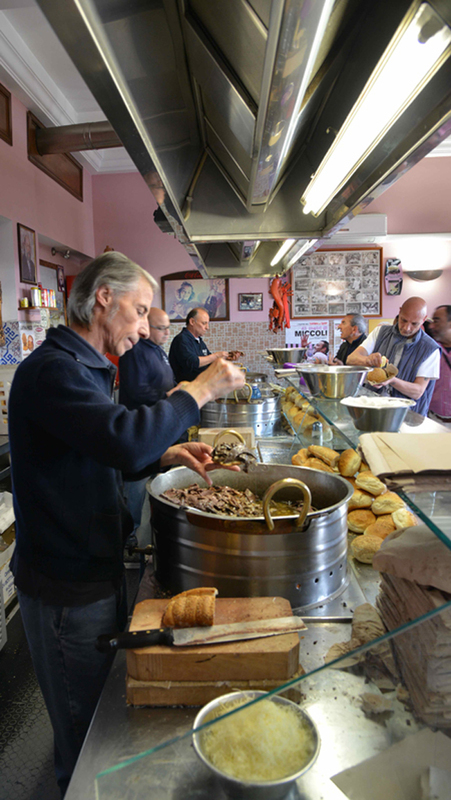 In particular pani ca meusa, a greasy sicilian spleen sandwich. Nancy Harmon Jenkins who is one of the great writers on Mediterranean food and a friend couldn’t undrestand my repulsion but as much as I love spleen (my mother makes a divine braised version that I will blog one day that I am with her in Lebanon), I couldn’t see the point of this sandwich. Well, not until another great friend, Mary on whose farm we were staying, sent us to Porta Carbona where not only did I finally discover that a greasy spleen sandwich could be absolutely scrumptious but I was also able to convert Amy to it.